Paint touchups | Halfbike | The compact and light standing bike, anywhere with you! Hi there, Unfortunately, the paint (lime color) of my HB has began to chip :( :( :( I have reported it to HB support team and they kindly responded with informations about the paint to help me finding it. I attached the picture they sent me for reference. 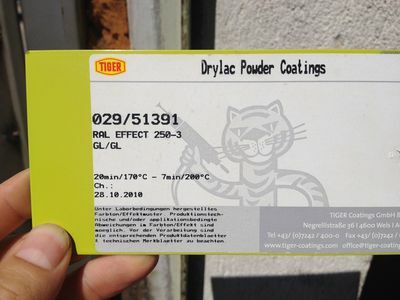 I have contacted the paint manufactures (Tiger) to ask them a sample in order to do some touchups, but I am still waiting for their response. I would like to know if that is something you guys have experienced, and if it's the case, where have you found your matching paint (especially the LIME color ;) ). Also, do you have tips to perform touchups (is there a technique to get a clean result? Specific primer to use?) Thanks!